This chic bright neon fanny pack is the perfect way to express your style in a modern way. This bum bag is fashionable as well as functional. You can wear it around your waist and keep your personal belongings in it like I.D., keys, credit card, cash, cell phone, lip gloss, and concert tickets all while keeping your hands free for fist pumps and high fives. They are great to wear as concert fanny pack, festival fanny pack, rave fanny pack, amusement park fanny pack, baseball game fanny pack, camping fanny pack, and carnival fanny pack. 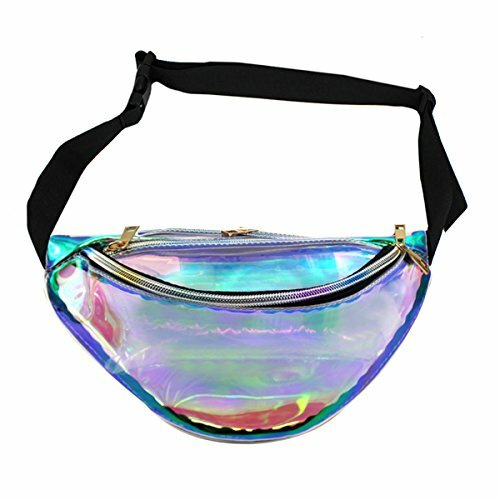 This fanny pack is also a Black Light Fanny Pack which means it glows under a black light so when you are at that party you are going to glow! Please note that Blue, Red, Purple, and Black are not Black Light reactive colors. Note:This fanny pack now has two size,this is the smaller size.Please read the size chart before ordering. Material: Hologram PU leather.Size:11*5.9 in/28*15 cm(L*H). Adjustable strap.One main zipper compartment with two zipper pullers and another little zipper pocket on the top. Perfect matches your fashionable suit.Great for concerts, barbecues, festivals and traveling. Great to be used as a concert fanny pack, festival fanny pack, rave fanny pack, amusement park fanny pack, baseball game fanny pack, camping fanny pack, and carnival fanny pack.